The Do’s and Don’t’s of Computer Based Examination. Why go to the examination center very early? Well, you need to know that at the examination center, there will be a data verification exercise to check if your biometrics are actually correct. 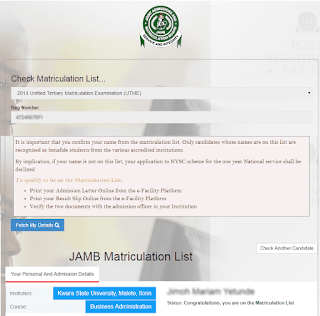 The Joint Admission and Matriculation Examination Board (JAMB) conducts this to ensure that there is no impersonation and to verify that your data were correct during the registration exercise. Dear, don’t be surprised that no matter how early you go, you will see people who came earlier than you and you will have to queue up… Don’t even imagine the stress. The earlier the better. This will not only save you time, but also energy and zeal. Going early will enable you complete all checks on time and you will be able to settle down before the commencement of your examination. In addition, in case any problem arises, may be you have a little problem with your data, you will be able to solve it on time and save yourself from running up and down while your colleagues are already settled down. You know, unsettled mind is not good for exam. If your system is already scattered before the exam starts, how will it be when you see the questions? Before the examination starts, you will be addressed and instructed by the instructors or coordinators of the e-exam center. It is very important that you listen attentively to all the instructions to avoid stories that touch. This is another reason why you need to go to the examination center early. In the examination hall, it is “One candidate, one computer”. And as you’ve already known, you’re on your own. If you have been the computer guru type, please don’t show off. Don’t attempt to use any short-cut keys. Don’t use the keyboard “Backspace”, don’t press F5 to refresh. In fact, don’t try anything outside the instruction (I dey beg you, lol). Be time conscious. Each candidate is given equal timing. Immediately you hit the start button, the countdown timer starts and once it reaches zero, you’re done. There is no extra time and there is nothing like “Please sir, I haven’t completed it yet”. It will automatically submit for you whichever number of questions you’ve successfully answered will be recorded. So, you are advised to avoid wasting of time. Don’t get stucked on question(s) you don’t know. Don’t waste time doing calculations of one difficult question while you can skip to next. Answer all the simple questions you know first. Then navigate back to the skipped questions and then calmly solve them. Remember: “All question carries equal marks” so, why waste time solving one tough question when there are five simple questions to gain marks and time? Fear is your enemy, don’t be afraid. Conquer your fear, free your mind and stay calm. Finally, efficiency without God’s sufficiency is a deficiency. Put your trust in God, believe in yourself and it shall be well with you. We look forward to seeing you jump up in joy with… Yes! I made it! Great! Also check out the new Jamb CBT Software. It helps.